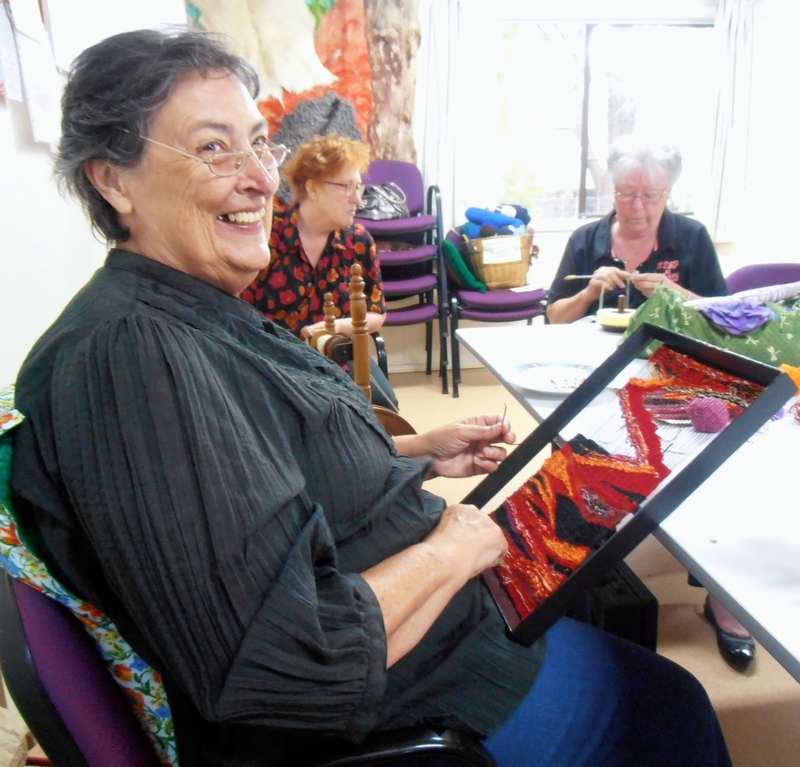 Here is Eileen doing a very vibrant weaving on Tuesday. She looks very happy. 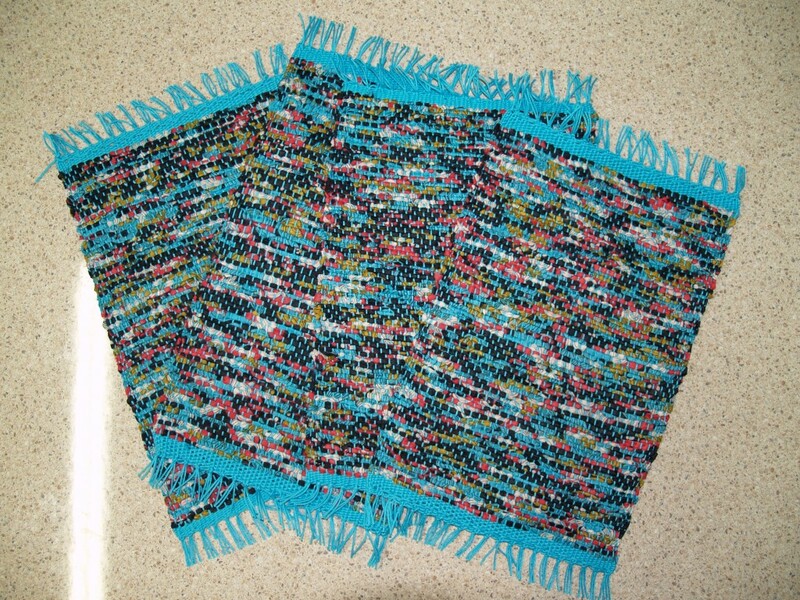 These gorgeous placements were made by Megan, who is one of our weavers who we haven’t seen in a while. 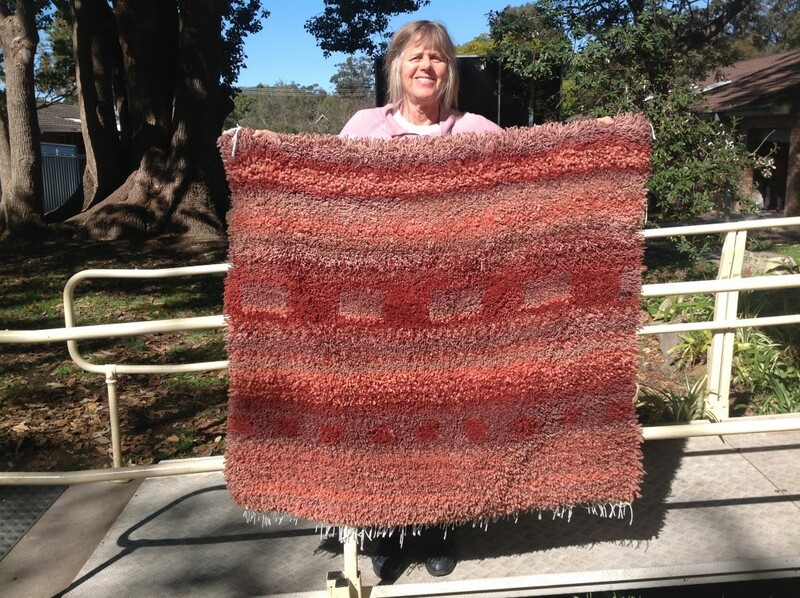 We hope she comes back to us to do some more beautiful weaving and so we can enjoy her company again. This is a small pouch woven by Rachel during her trip to Oklahoma. 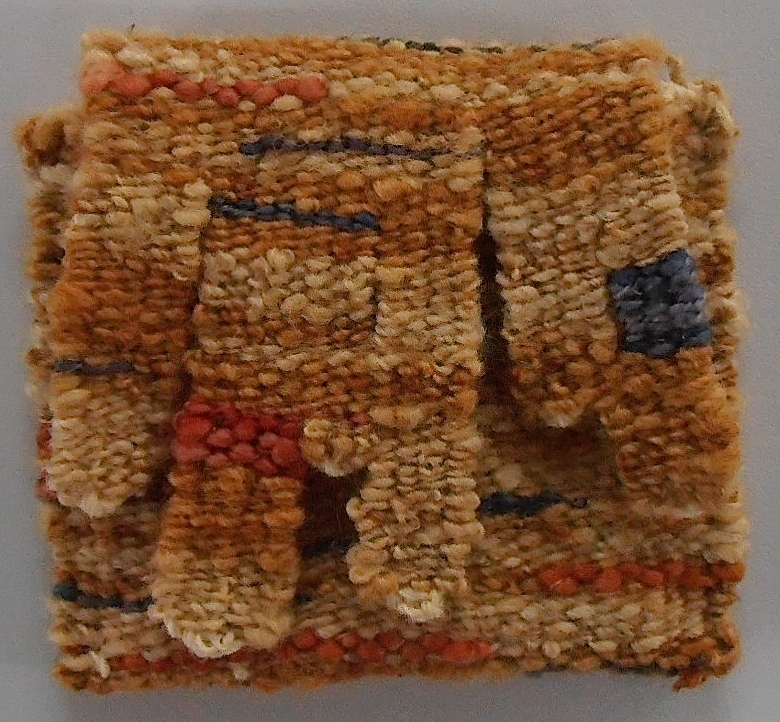 This type of pouch could have been worn around the waist to hold small treasures or medicines. 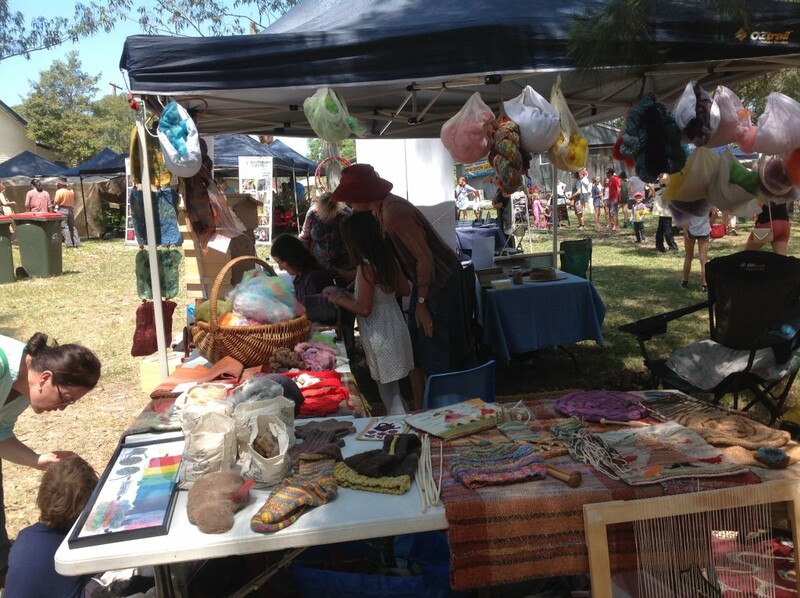 We had a great time at the Mangrove Mountain Country Fair this year. We had a bright and colourful stall with plenty of our lovely wares on display. The day was sunny but not too hot so it was beautiful spending the day outside. They had a billycart race, lots of animals including baby ones, old farm equipment and lots of entertainment. The Viking group were there again so we had a good chat with some of them. We had a lovely local girl as our carding helper for much of the day, being supervised by Louise. This sweet little girl also spent much of the day helping us at last year’s fair also. It’s good to see so many of the young people there interested in what we do. 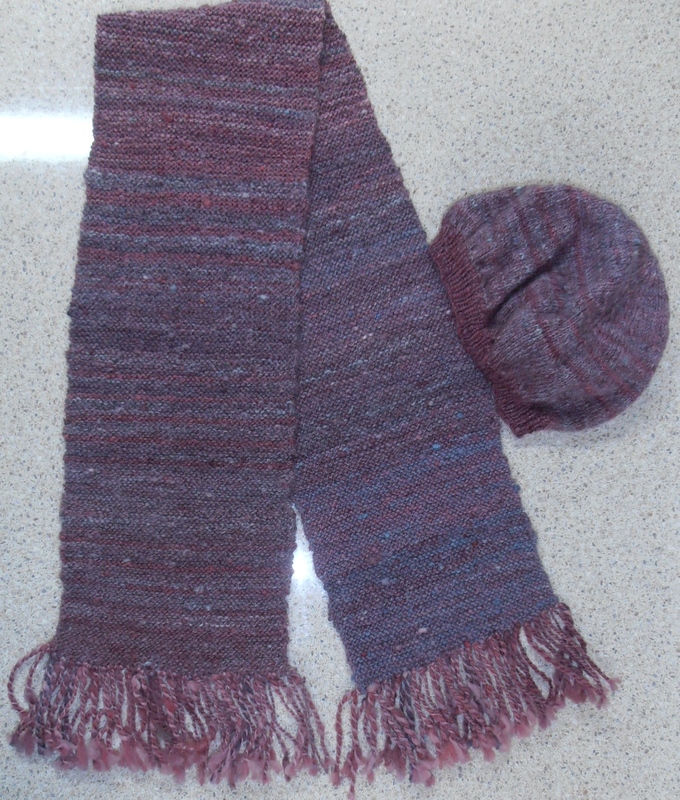 We gave away many woollen bracelets which were made by Naomi. One of the local high school girls came to us to let us know how much everyone enjoyed us coming up to demonstrate what we do. She mentioned that everyone compares their bracelets when they get to school on Monday, (obviously still wearing them), and those that don’t have them enquire about where they got them from, and vow to look for us the next year. That was so good to hear for us. We had lots of enquiries about what we do at The Cottage, and a number of people asking us if we take alpaca or wool fleece to which we replied YES. Absolutely. 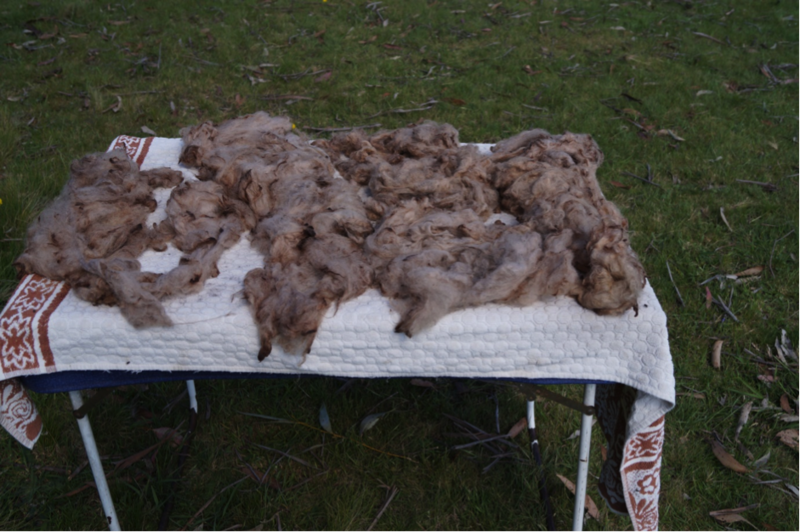 So if there are any farmers out there who wish to donate some of their fleece to the guild, we would be most grateful. Just call us, and we will organise someone to come and pick it up. 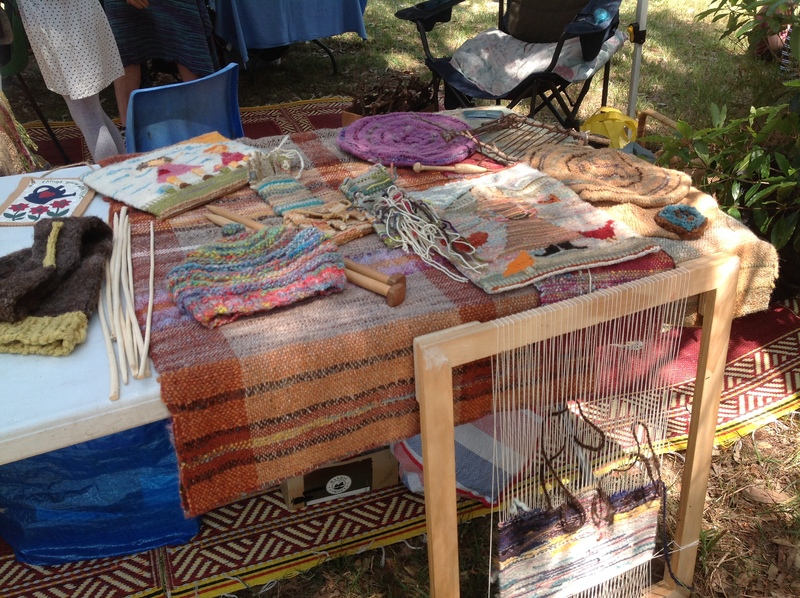 Rachel brought some of her lovely weaving for our display, and the organisers said that our stall was even more colourful than usual. So a fantastic day. This scarf was knitted by Sandra. Such beautiful, warm colours and lovely thick wool. 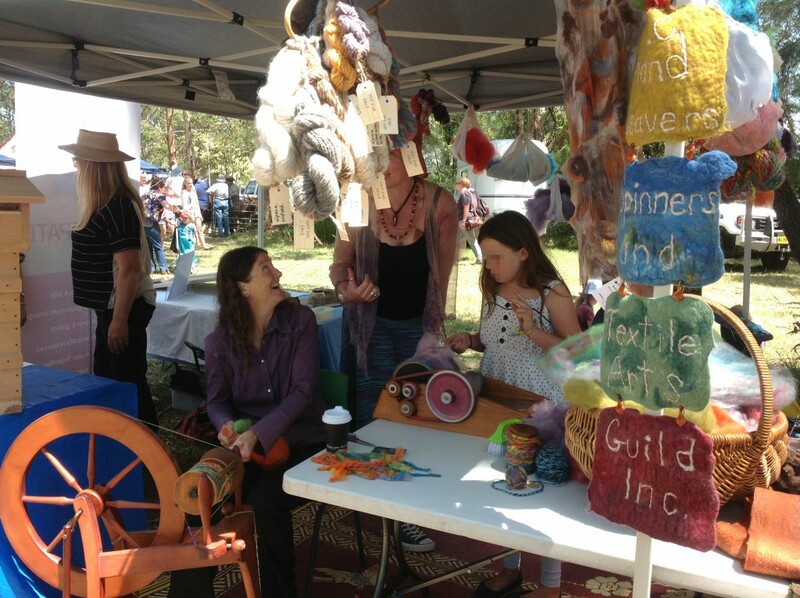 We displayed Sandra’s scarf at the Steiner Spring Fair this year. 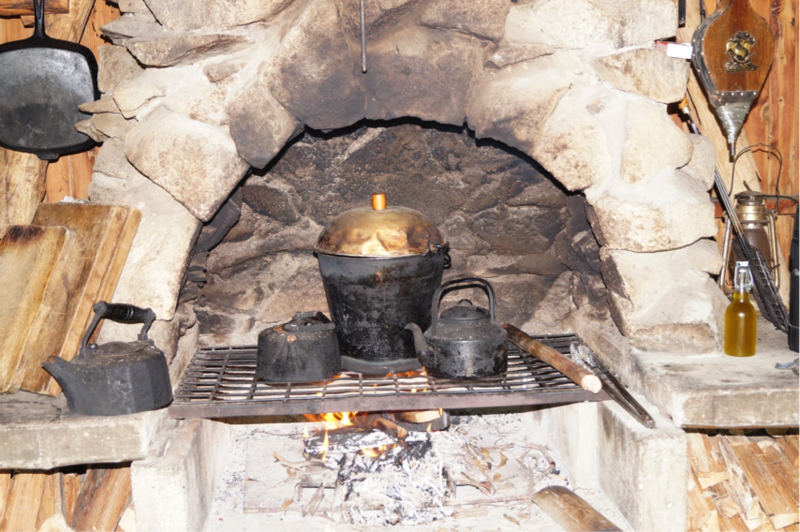 A couple of times a year we camp at Barrington Tops in a cabin with no power so all cooking is done on an open fire. I always take a couple of old Spin-off magazines to read and I had read an article about a Canadian lady dyeing wool after Christmas using her cedar Christmas tree. It sounded like fun so I thought I would give it a try using radiata pine as a huge one grows nearby. So I put leaves and stems, as much as I could fit in a stainless steel bucket, topped it up with rain water from the tank, lit the fire and boiled it for about 4 hours and got a good amount of colour. Time ran out and I needed certain ingredients that I did’nt have, so nine months later when we went back I took the dye up with all ingredients except one which was alum. I couldn’t buy it anywhere and this was the mordant I needed to open the wool fibres for the dye to take. I searched around and discovered stale urine works, so I thought “Oh well, I will give it a go”. 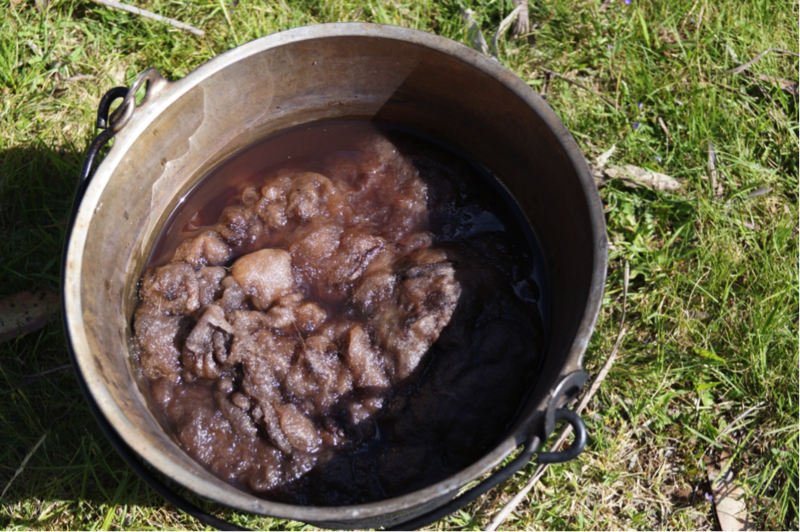 So I boiled the wool in with water, urine, cream of tartar, bicarb soda and vinegar – tried the lot. It simmered on the stove for an hour, then I left it overnight, then put in the dye and simmered for about another hour. It was hard to tell with accuracy as loading up the fire had its highs and lows. I was pleased with the result. 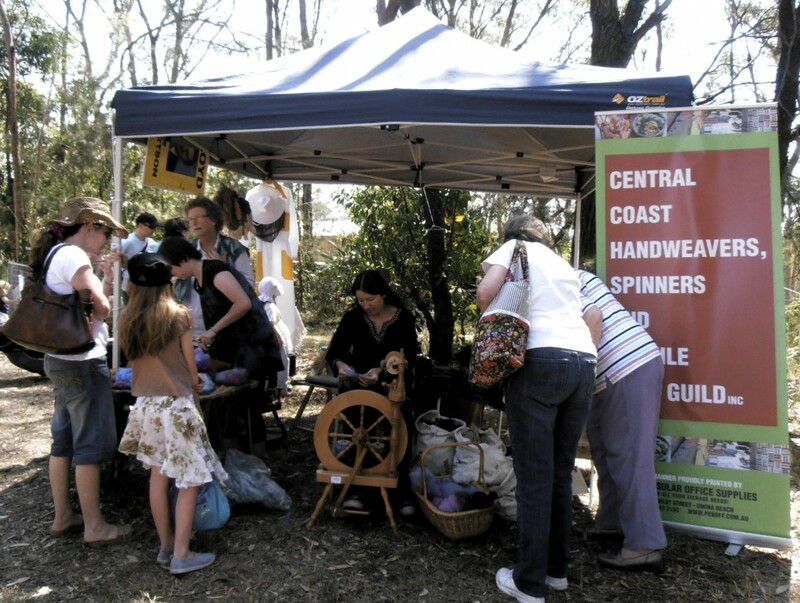 We will be attending the Mangrove Mountain Country Fair this Saturday, 17th October 2015. It’s a great day out in the country so come along and see us there. 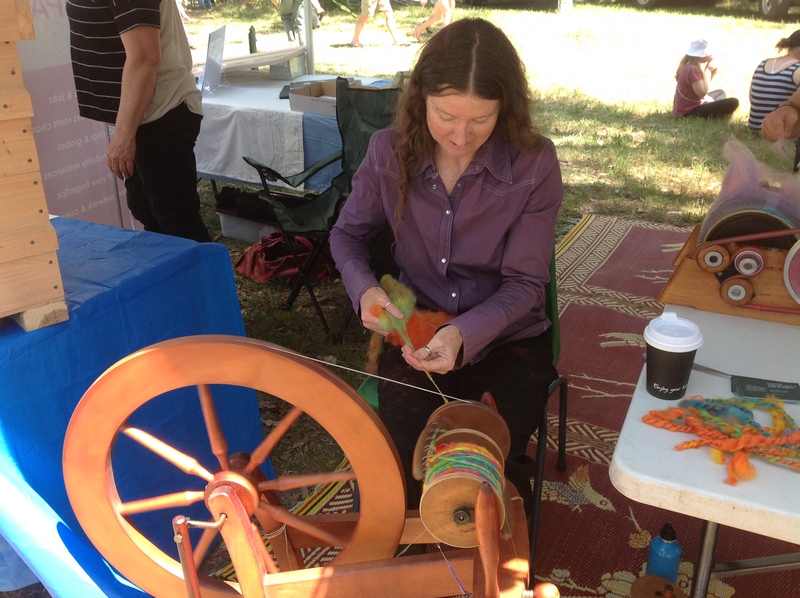 We will be doing spinning and carding demonstrations, and perhaps a few other things too. Hope to see you there. 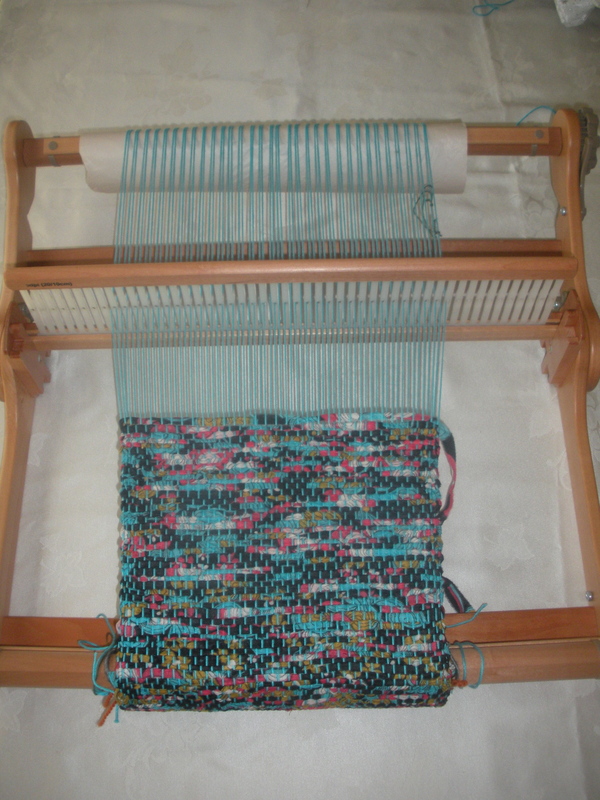 Margaret has been working away on the big loom for quite some time now. Each week a few more rows are completed and everyone is waiting to see the finished product. Well, here is the finished rug which Margaret is going to use in her home. It looks so beautiful and very plush. 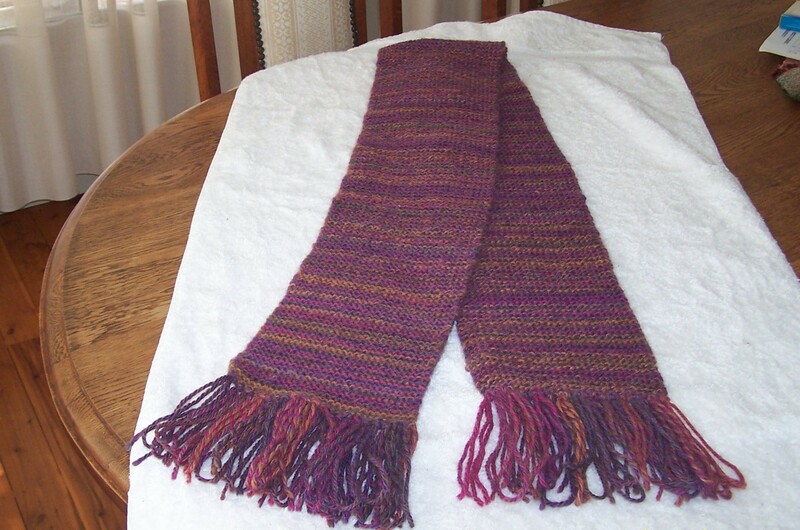 Wonderful weaving, Margaret. 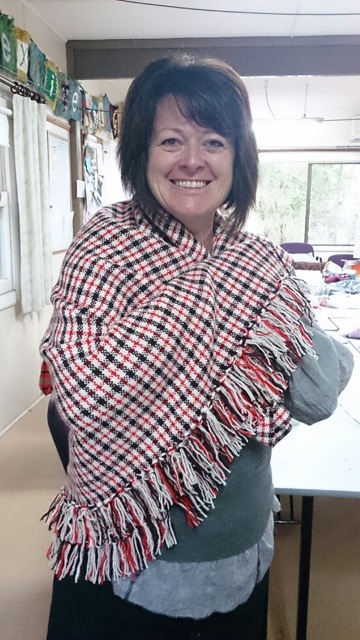 Vickie and Lyndall worked on this wrap/throw and here is the result modelled beautifully by Vickie. This is one of our prizes in the raffle for The Gathering in 2016. By Lyndall.